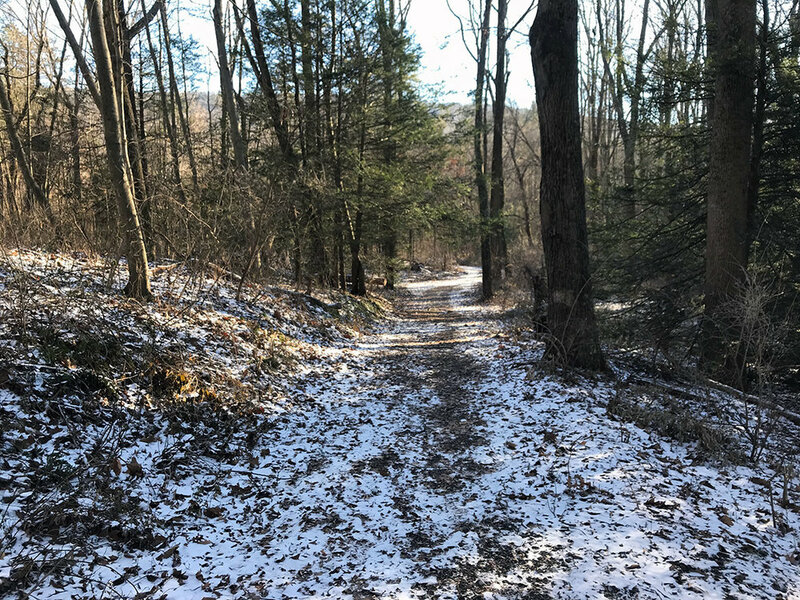 The first couple of weeks of the New Year have brought less than favorable weather conditions for spending time outdoors. We’ve had multiple days of below freezing temperatures, sub-zero wind chills, and almost every body of water in Pennsylvania is frozen solid. 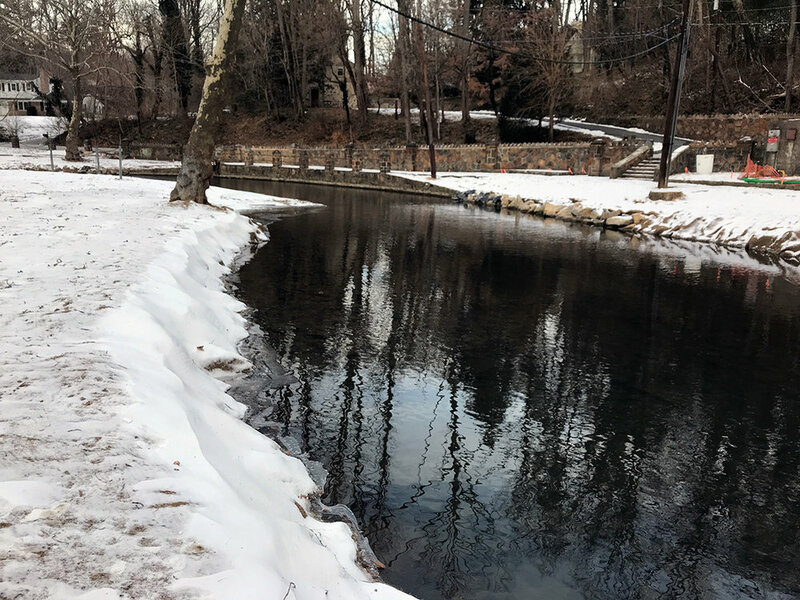 Even some of the spring creeks have been seeing ice on the edges of their banks. Against my better judgment, I have ventured out in search for trout three times since the end of December. The Monocacy Creek just below the St. Francis Center for Renewal. 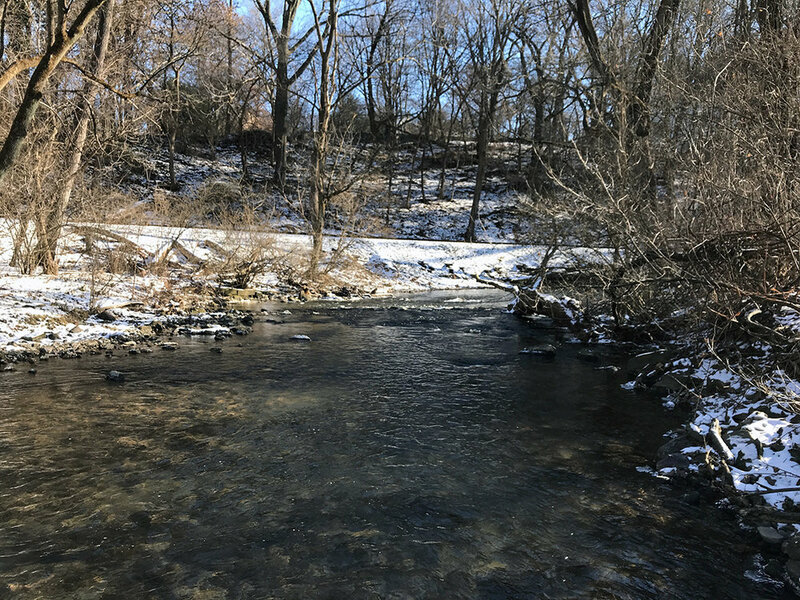 During the first weekend in January I headed over to the Monocacy Creek in Bethlehem, Pennsylvania. There was a section of the creek I’d never fished that runs behind the St. Francis Center for Renewal property and I wanted to check it out. I didn’t bother hitting the water until lunchtime. There are a couple of parking spots off of the south side of Bridle Path Road just before the bridge that crosses the Monocacy. It was so cold that day that I had to leave my truck running as I attempted to tie nymph patterns on with 6X tippet. I also discovered that wading boots don’t fit as well in freezing cold temperatures. It was like trying to shove my feet into a shoe that was three sizes too small. 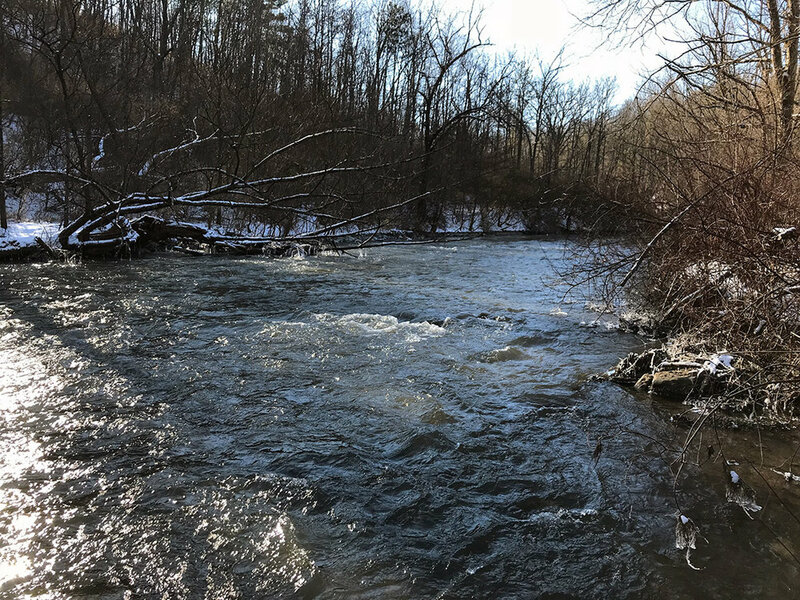 After I was geared up with my 9’-5wt fly rod I walked along the western bank of the Monocacy until I was able to duck into the woods and escape the biting wind. The creek looked great for January and I was confident I’d find a wild brown trout to take either my Frenchie Nymph or Black Zebra Midge. I fished hard that afternoon, drifting my nymph through every probable fish lie. Unfortunately the only things I hooked into were some submerged sticks and leaf debris. Is it just me or does that debris get worse in the winter months? This portion of the Monocacy is not very well marked. Down below the Covenant Christian Academy there is an orange electrical chord stretched across the creek. It seems to indicate the end of a section but there are no signs. I’ve viewed maps online that show you can fish all the way to Illick’s Mill Park. If anyone reads this and is familiar with the Monocacy, please comment and let me know. There are railroad tracks that follow the Monocacy throughout this entire section so access is not difficult, but knowing where you are legally allowed to be is tough. I also explored upstream above the Bridle Path Road Bridge. Up here the creek narrows significantly. There are some great holes and the stream runs behind a large development and again, it is impossible to know if you’re trespassing or not. When in question, I back out. The slower moving water in Illick's Mill Park. I headed back to my truck and drove down to Illick’s Mill Park and fished the water in the park. While trying to step over line stretched across the ground to stop Canadian Geese from invading the park, I watched several trout sipping midges on the surface. It was getting dark and the air was frigid. I tied on a #20 Black Zebra Midge with a black bead head and dropped it off of a natural Hare’s Ear. I took off my indicator and cast my line upstream ahead of the fish. I was shocked to see my line stop and when I pulled I saw I’d moved a good fish off the creek bottom. It turned out to be a beautiful brook trout. It must’ve been left over from spring stockings, but it was beautifully colored and a large fish. I released him quickly to avoid freezing his gills and desperately tried to warm my hands as I headed back to my truck to call it a day. The large brook trout I caught in Illick's Mill Park. Last week Pennsylvania had some truly whacky weather. It was cold at the beginning of the week and then it gradually warmed into the 40s and on Friday it reached almost 60 degrees. This warm weather was accompanied by heavy rain. The combination of warm air and rain resulted in many of the frozen creeks breaking up and ice jams were everywhere. It made for some great photographs. Over the weekend I had traveled to northwestern Pennsylvania to do some hunting and on the way back I decided I’d stop in and fly fish Spring Creek. Every creek or river I crossed on Rt. 80 heading east was ripping. The USGS on Spring Creek had hit peak on Saturday and I was hoping by the time I arrived Sunday afternoon it would be fishable. I stopped in at TCO State College to grab a couple of midges because I forgot one of my fly boxes. They asked where I was fishing and I told them Spring Creek and they said I was braver than they were. In twenty minutes I found out why they said that. Spring Creek was running higher than normal with all the rain and snow melt. I parked at the Benner Springs Fish Hatchery access area and once again had to leave my truck running so I could warm my hands while tying #20 midges onto 6X tippet. Once I got rigged up I fished the water below the Shiloh Road Bridge. Spring Creek was running high and cloudy, and hardly resembled the beautifully meandering Spring Creek of April or May. The branches dangling in the water were covered in ice shaped like strange blown glass horns. 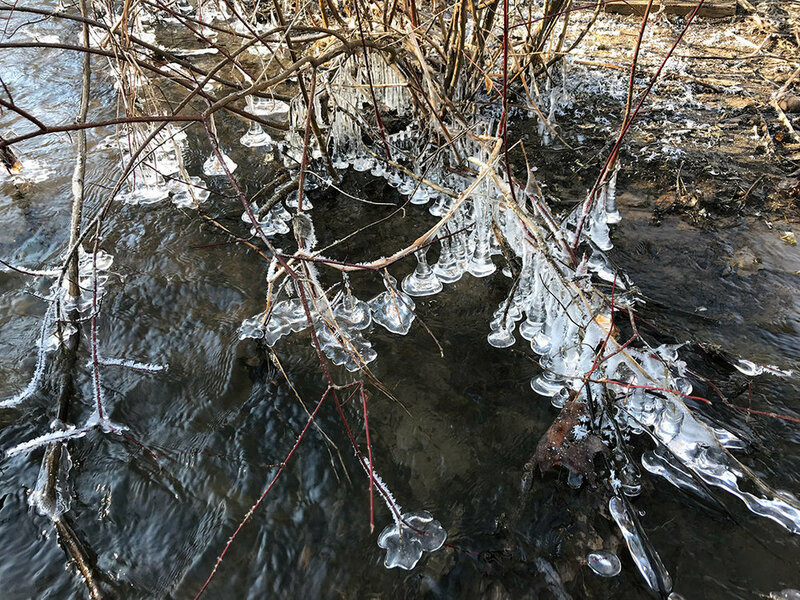 Abstract shapes formed by ice on branches on Spring Creek. I drifted nymphs on a 9’-6X leader with a small indicator. I had to use a good amount of weight to get down in the fast current. After twenty minutes my hands were in a lot of pain from the cold air. I worked the water up to behind the hatchery and was unsuccessful at moving anything other than a few sticks and tree limbs. Eventually I had enough of the insanity and decided I head south on Rt. 322. 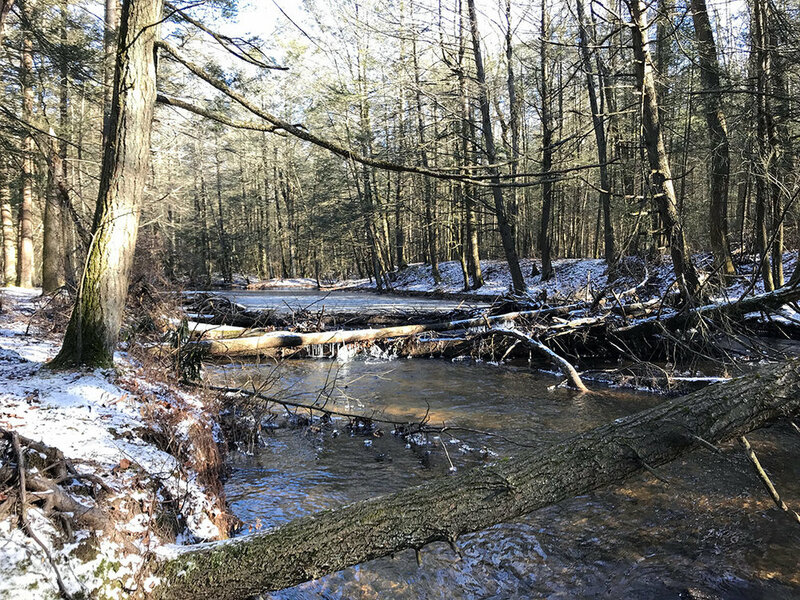 A view of Clarks Creek in January just after the ice went out. On my way back through Harrisburg, I got off at the Halifax exit and drove over to Clarks Creek to see if the rains had moved the ice out. Sure enough, Clarks was open! I parked on the game lands off of Rt. 325. The weather was a few degrees warmer an hour south of State College. I assembled my Orvis Recon fly rod and headed into the woods. The first section of the creek I came to still had some ice on it, but above and below, the creek was clear for hundreds of yards. I drifted a Y2K pattern above a midge and had no takes. Clarks Creek was the first place where I saw three or four trout while trying to quietly walk the creek bank. I worked my way upstream to the large logjam at the 90-degree turn in the creek. It was peaceful and there wasn’t another soul to be found. Unfortunately there wasn’t a fish to be found on the end of my line and I walked back the way I’d come. I was cool, calm, and fishless and that was ok. I walked the path out to my truck, broke down my fly rod, cleared ice out of the eyelets, and thought of spring temperatures. In a couple of months it will be March and 50 degrees will feel chilly. Here's to warmer weather that's just a couple of months away.